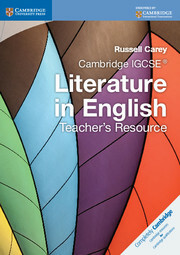 Provides full support for students and teachers of the Cambridge IGCSE® Literature in English syllabus. 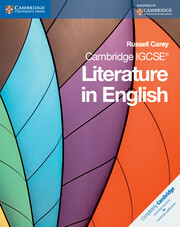 In combination with the Cambridge IGCSE Literature in English Coursebook this Workbook will enable students to prepare and practice, giving them confidence in the classroom and a wider enjoyment of literature.Cambridge IGCSE Literature in English Workbook gives students a wide range of activities to practice interpreting texts, asking questions when analysing extracts and additional support for essay writing. It includes a variety of text extracts from around the world, and extra support for students, particularly in areas which may require additional support such as poetry, drama and unseen extracts. Written by Russell Carey, who is an experienced teacher and has delivered training courses in the UK and internationally. The Workbook follows the same structure as the Coursebook so perfectly complements and completes the series. 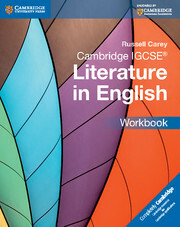 The Workbook has particular focus on those aspects of the Cambridge International Examinations course that students struggle with most; unseen poetry and analysis of plays.